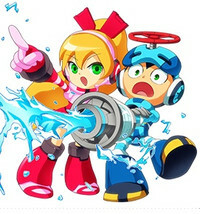 As promised, Keiji Inafune and the Mighty No. 9 team had some big announcements to make at Anime Expo. Chief among them was the reveal of a CG-animated series, currently in production at Digital Frontier (Resident Evil: Damnation, composite work for Wolf Children and Summer Wars) and slated for a Q2 2016 release. You can see a teaser for the series—for which Digital Frontier intends to make 26 22-minute episodes aimed at children ages 6-11—along with a synopsis below. There's also a new crowd-funding campaign aiming to drum up some money via PayPal for even more bonus content. Here's the announcement video for the campaign, which the site stresses will not be used toward any existing content in the current state of the game. The first stretch goal, full English voice acting, kicks in at $100,000. You can find out more about the campaign, including all the backer incentives and more, over at the official site and the latest Kickstarter update.